In a nutshell: You’ll be off the brakes in corners, riding faster and feeling totally confident by the end of the day. Trails used: Fast trail centre and bike park style terrain. The Flow course delivers a philosophy of riding that will allow you to ride the whole trail smoother, more composed and ultra efficiently. Tricky trail features will soon become tools to maintain and gain speed, and corners will serve to change direction with pace and style. If you find yourself out of breath and in a constant cycle of pedalling hard then braking harder, the flow course is for you. All other locations DO NOT use an uplift. Pumping for speed – How and where to pump so you can gain free speed on any trail whilst maintaining a balanced and strong body position. Squashing for control and speed – Squashing bumps, jumps, drops, rocks and rough sections so you can approach trail features with full confidence and ride faster. Line choice and optimum speed – Choosing smooth and fast lines on the trail and learning the optimum speed to make trail features flow. Advanced Flat corners – Leaning the bike and how to carve turns, maintaining grip and how to keep your speed. Mastering the drills so you can continue to improve after the course. Advanced Berms – How to stay off the brakes, lean more than ever before and exit even faster. Take away techniques to constantly improve your skills. Focus and Flow – Analysis of a full trial including how and when to use core skills and speed techniques to make the trail flow. "This was our first time in the Forest of Dean and the first time meeting Olly Morris. The Flow course covered body position, line choice and cornering in a great location using instruction, video, practice and discussion of technique. Olly is a great guy and great instructor with a relaxed and fun approach to coaching. 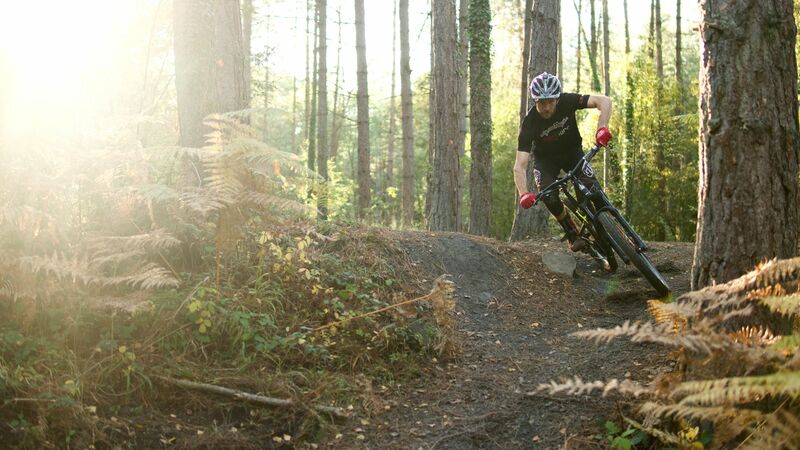 We will be back ..."
"Another great day on the bike with Olly down at the Forest of Dean on the flow course! I wanted to get better at cornering and with all the new skills Olly taught I definitely feel more confident at cornering. I would highly recommend any of these courses to any level of rider. Olly breaks everything down and makes everything really easy to learn and the whole day is really layed back. I feel like my riding has transformed already from just doing the progress and flow courses and I can’t wait to get on the airtime course. We had a great group on the course and was a really good laugh. Olly even took the time to help me set up my suspension properly on my new bike, top guy! Cheers Olly!" "Every time I want to iron out bad skills and up my MTB game I go straight to courses run by Pro Ride MTB. Olly Morris is a wealth of knowledge and adapts his coaching style to the audience which makes for impacts beyond "a day on a course". This is stuff that gets processed in your brain overnight and the next time you ride, it translates to more efficient speed, safer and more precise cornering and less time sketching out on bends or trail features. I have done a few of Olly's courses but Flow is one that every rider can benefit from. It's boosted my confidence no end and the small group size meant we all learnt from each other and progressed pieces of our own MTB puzzles whilst encouraging each other along. Priceless. Thank you so much." "Olly is a great instructor- bags of patience and knolage. Had a private 1 2 1 flow corse with Olly witch was great! Learnt so much about body position, pumping, timing etc. Has given me the ability to unlock and get free power on tap- awesome! The feeling of more control in a short space of time was amazing Just need to practice to make what was taught the new normal way to ride. Olly has planted the knolage seed and now it's up to me to work on it to make my ability grow. Well worth it 5 stars"
"This is the second course that we have had with Ollie as our instructor. First time the progress and then the flow course brilliant instructions breaking it down and rebuilding it to make it all flow and the speed just happened. If you have never been on a pro ride course get booked up you will not regret it." "What a good days ridein with a great coach! Tried to take it all on board and was a different rider at the end, thanks Olly for all your help and easy to follow instruction! Defiantly recommend to all, see you on the next 1 ?" "Will benefit you more than any component or upgrade, another awesome day, cheers!" "Fantastic day with Olly at Cwmcarn on the flow course. Olly’s coaching is spot on, he really knows how to get the best results for you, by stripping you back to basics and building you back up with the fundemental movents, that make it all make so much more sense. It is all done in a no pressure environment and was a really fun day and I come away a faster and more confident rider. Air time and tech already booked. Cheers Olly." "Had a brilliant day and feeling a lot faster and more confident in the corners. Nice one." "Thanks for a fantastic day, really learn't a lot in the day, hopefully get rid of some bad habits I've got in to with practice. Joe was a great coach and explained everything in a easy to follow manner. Will keep on putting in the hours and look forward to another course in the not to distant future"
"Amazed at how much I learned from one day with Ollie! He breaks technique down in ways that register, and then links the pieces together to achieve more confidence, better balance, speed, power, and flow...."
"I did the flow course with Joe at Hamsterley. I wanted to learn the art of cornering and this guy knows his stuff. After Joe shot a video of me he gave me some pointers regarding hips alignment (just get the slap ;o) ) I feel a lot more confident and just need to practice, practice, practice.. Deffo worth the money. See you soon for the jump course.."
"Cheers joe, I really enjoyed the coaching and I got a lot out of it. Nothings too much touble for you and only one word left to say, Feet!" "Joe is an elite rider and an elite coach. He has an amazing ability to look at your riding technique, tell you what you’re doing wrong and explain how you can fix it. The Flow course took place on some of the red routes at Hamsterley forest, so it's smooth trail centre terrain. The session concentrated on jumps, drops and berms. You’ll learn how to achieve more distance on jumps, how to squash jumps and drops, gain more speed in berms and effective riding position. By the end of the session I genuinely felt that I was able to ride with more speed and with less effort. I was able to jump better, squash better, achieve a better balance on the bike. Flow was a revelation for me. A real fun days riding. I suspect even the most seasoned MTB riders would gain some speed by completing this course." "Did the flow course after doing the progression course, which I think really helped take the fundamental learn on the progression course and build on them. I finished the day feeling way faster and dare I say with more flow"
"Did the flow course yesterday and straight away picked up more speed with simple and fundamental techniques. Definitely feel as though I had more time to think further ahead, felt smoother and gained a lot of confidence cornering quicker with a lot of lean angle (felt like a lot anyway). Now to practice the techniques and build on my new found confidence. Will definitely be booking the Tech course with Pro Ride!!" "I had a excellent day’s coaching with Joe in Hamsterely Forest, Very professional run course I would definitely recommend to anyone wanting to push there riding. I’m already seeing the benefits from the course, I now ride faster and most of all safer. I’ll be booking another course very soon"
"This will do more for your riding than any blingy, latest techy components, and all for only £90 and to top it of Alex is a really nice bloke." "So much better than spending cash on the latest super gripy and super fast tyres! Well worth every penny thanks Joe!" "Excellent day at Hamsterley with Joe, brilliant mountain bike skills coaching put in simple terms, explaining the technique which transfers on to any terrain, drops and jumps, weighting and un-weighting the bike through rough sections which built confidence on all terrain, steep turns and railing berms. So much fun and encourages confidence on the bike, well recommended." "Properly awesome day on the bike. I was worried that my skill would not be up to the course, but Alex’s instruction brought me on loads. Learned a lot and much more confident and faster on the bike now. Boom"
"Had a fantastic days coaching with Joe at Stainburn. I’ve been riding for a few years and had coaching days before but this was by far and away the best investment I have ever made in my riding. Within a matter of hours Joe had me riding Stainburn at a speed I never thought possible, making a once bone jarring trail smooth(ish) and flowy. The best thing about Joe’s approach is that he doesn’t teach you to ride obstacles, he just teaches you to ride your bike, better, much better. I didn’t have to approach each trail feature with a long list of things to remember; with simple tips and some practice within a matter of hours I was jumping, hitting drop offs and railing berms way better than I thought possible, and it all felt natural. If you want your riding to improve fast then I can’t think of a better way to do it." "Great follow on from the Progress course, thanks Joe I now feel more confident about all aspects of my riding. My only dilema, is to tell all the Guys I ride with just how good it was and lose the advantage....."
the Flow day does just that! If your thinking of investing in some coaching or want your riding to improve stop thinking right now and just book it, it’ll be the best decision you make to improve things all round, especially your enjoyment. I would fully recommend and endorse these guys!!" "The whole day was structured really well with Joe deconstructing every thing we learnt back to the very basics. I could definitely feel the difference in my riding at the end of the day, much sharper and quicker but most importantly, using the correct technique. Joe was an easy going coach, happy to spend as much time as was needed to allow us to get the instruction nailed. I’ll be back for more tuition in 2013!" "Superb day despite the cold and snow. Alex really lived up to the Pro name, leading us through a series of drills, progressively building skill and confidence throughout the day, all the time dispensing advice and encouragement. A definite injection of smooth and flow into my riding. Thoroughly recommended, definitely worth every penny. I’ll be coming back for more." "Totally awesome day skills riding with Joe, loads of improvement from the first minute to the last, the photo on facebook was proof of that! It was more than just sessioning sections over and over; Joe is top-bloke and we really enjoyed his analytical approach to coaching and enthusiasm for everything bikes! Brilliant course, well worth it, totally recommended if you’re serious about improving your enjoyment on your bike. Thanks Joe." "I’m a total sceptic, and not easily sold on new things. Well after I had listened to the theory behind the actual flow and balanced riding I was well not really sold. Well I can tell you now, when I got back on the bike it was a strange feeling, I have been stuck at one speed for ages, not anymore though! Top draw, since doing the course I have been on bike and feel faster with loads on confidence, which I didn’t have before, job done, cheers Joe"
"Fantastic day at Stainburn with Joe. Great teaching technique - explain, demo and practice. Learned loads whilst having great fun with a top group of guys. I Really recommend this mountain bike skills course, as you will improve no matter what level you think you are!" "Who’d have thought such simple phrases could make such a big difference? Terrific coaching, the right amount of sessioning for immediate reinforcement and good company make for a fun day out. Go for it!" "I was very nervous going into this course and being the type of person who doesn’t enjoy having an audience, even more so when I realised I was the only female! But Alex and Sam treated me no different to the guys, and Matt, Mark and Andy were equally supportive! Learnt so much on the course as it was explained brilliantly, with plenty of humour! Everything was broken down into simplified areas and I found myself going back to the trails on Sunday at The Forest of Dean, putting into practise everything we had been taught, learning from them and having one of the best days riding ever! Book these courses now... You won’t regret it but will have the best time :) Thanks again Guys! Awesome day.."
"Spent a great day at Forest of Dean with Alex and Sam. Information on bike setup and the way Alex helped set the suspension up was superb. The fundamentals were well explained using simple analogies, practised and exercised on the day with good feedback on how mistakes were being made or where improvements were seen. I never thought going over roots and rough could be so easy. On all items Alex taught us not only how but why, which means learning can continue following on from the course in practise with a background understanding. The other course members were all great and all offered each other plenty of praise and support. In summary, great tuition from Alex, great assistance from Sam, well worth the money. Thanks very much." "The day started off with Alex having a quick look at our individual riding styles on a short section of trail, followed by some alterations to our suspension set ups, with a clear explanation of what he was doing and why. Then started the re-education of riding style and positioning on the bike. Seems I had picked up some very bad habits over the years. Been out a few times since the course, i’m probably a little bit quicker than I was before, but more importantly I am now riding much smoother, safer and haven’t gone over the bars since the course. couple of months practice, and I’ll be ready for the Airtime course. Thanks Alex and Sam." "When you do things right, what a difference it makes... being taken back to basics, ironing out the bad habits and adding the good. The difference between the beginning of the day and the end is incredible. Awesome :-) Now just to ride ride ride and make use of everything learnt!" "Thanks for a great day. I’ve honed smoother berms and more confident that I can grip at speed. I’m now beginning to use my legs more and relax my arms.. the only thing was I also wanted to do more, airtime, I feel a natural progression for me is the Airtime course and doing the boulder drop!!!" I’ll now try and use the new flow techniques over the coming months and will be back for more in the future...thanks Joe"
"I had been mountain biking since the early nineties and more recently had got into trail riding. I decided to get some training and booked the flow course on the saturday to be followed by the airtime the next day. By the end of the course I can genuinely say that I have learnt more in a weekend than in two decades of riding. Ben gave first class instruction in an effortless and charismatic way that made the whole course alot of fun and all the tools we needed to take away were passed on to us in an articulate and concise way. I would say to anyone who has been into mountain bikes for decades or are just starting, book yourself on some of these courses and learn to do it properly. Alot of things become clear as the techniques are explained and your confidence will soon follow. Thank you Ben for a brilliant day! Off to practise.....feet,feet,feet....."
"We did the flow course with Joe F at gisburn , joe told us what it would cover but also asked us what we would like to do . Joe put his point across really clear and made it easy to understand him, he was also very patience and at the end of the day he was still asking us if there was anything else we would like to cover, and that was after getting soaked through. Thanks a lot Joe F , your a real gentleman mate and a credit to Pro Ride, would recommend you to anyone. Cheers Mark." "Top day, top instructor although I think I was punching a bit above my skill level with the flow and the progress course would have been a better option! Saying that Joe was a great and explained everything nice and clear and let me go at my own level, I just wish that he had been recording when I nailed the drop off !! I now I have a good understanding and learnt loads and hope to get plenty of practice in and will be back for some more guidance." "Great day highly recommend to any one wanting to improve very quickly. Clear, understandable and very quick to achieve speed higher than you believe possible. Improved all round riding more in one day than years of frustrating trial and error. Thank you again"
"Hats off to Joe of Pro Ride, this guy knows how to bring out the skills in you that you will never find out just by riding on your own, in your local trail over and over again. I would love to write the details but even myself, actually until now I’m trying make sense how I made those descents and drop-offs look (and feel) like childs play - this is at stainburn forest guys, those who have been there would understand. And Those of you who are planning to upgrade on something to your bike make sure you get a mountain bike skills course with these guys too, worth every penny literally. Hope you read this and give it a go, Again Pro Ride (Joe) hats off you mate, topman." "I have now had two sessions with these guys. On both occasions the change in my riding is immediate! This is the best upgrade you can buy! I now have confidence when riding trails for the first time that i can handle most situations and build speed and confidence the more i ride. I definitely plan on booking more sessions with these guys in the new year! P.S.Alex - i still owe you an inner tube!" "Thanks Jo for the useful tips and advice. Followed your recommendation and spent the weekend at Coed y Brenin doing The Beast and various other trails. Great fun and as you suggested great training for the Cape Epic. Thanks again Simon"
"Fantastic day with Joe who had a great empathy with a group of ageing off roaders 'Feet Feet Feet' has transformed my riding. Thanks Joe"
"Had a great day at Stainburn with Joe and the other riders. Was good to go back to basics and eliminate the bad habits I had got into. Was a great confidence boost....Off to Llandegla and Coed this weekend, so we’ll see whether I can take what I learned to the trails!!!" Leave a review for Flow here.